It’s no lie that I love a good pair of skinny jeans. I wear them constantly with flats, heels, over-the-knee boots, you name it. They’re easy to dress up or down and are definitely the most refined style of denim, in my opinion. With that said, I’ve always been into the boyfriend jean look, but don’t feel like it’s the most flattering fit for my figure. The only pair of boyfriend jeans I own is a pair by Current/Elliott from a few years ago and I just never wear them. I’d almost given up hope in finding a pair that looked good on me until I happened upon this newer style, also by Current/Elliott. After reading some buyer reviews on the jeans, commenters noted that this pair had more of a girlfriend fit vs a boyfriend fit. Not totally sure what that meant, but they indicated the jeans were less boxy and more fitted at the hips, waist and knees, lending a slimmer feel to the typical boyfriend denim. I decided to order two sizes just in case, and to my immense satisfaction, the smaller size fit perfectly (isn’t that the best?!). I’m not sure whether it’s the updated fit or just the slimming effect of the color black, but this pair is the real deal. This pair is now in high rotation at the moment in my closet, which gives my favorite pair of skinnies a much needed break. Did I mention these jeans are on sale for under $180? Yes, please! That gray coat is gorgeous! Love this chic winter look. The jeans look great on you and I am loving your coat! I thing I will be wearing a variation of this look today love the gray and black combo, adore this coat. I totally adore these skinny jeans on you! And the jacket is simply stunning! That sweater looks so cozy! Also loving the metallic clutch and those earrings. Your coat!! As you know, I am seriously obsessed with grey. Also, those jeans look great on you! I honestly didn’t even notice they were a boyfriend jean until I read about them – I thought they were a baggy skinny, but I really like them!!! 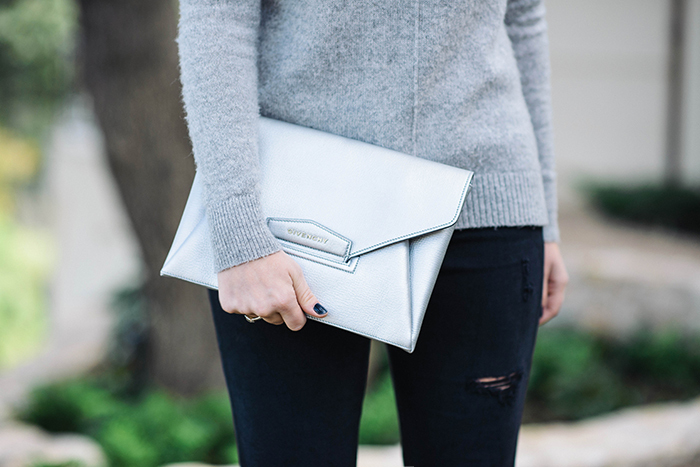 Love the simple yet chic pairing of gray with black. Love the gray on gray! 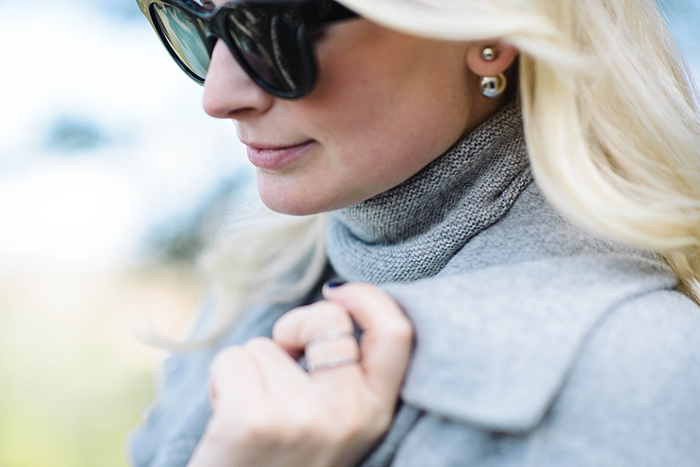 One of my favorite combos in the winter is gray and black. That sweater fits you like a dream. I love the greys and blacks together. You are seriously the chicest! You always make me want to beef up the amount of grey I have in my closet, love! Ah, yes – I’ve been on a gray kick too with this gloomy weather. They are a great pair of skinnies, because thats where my eye went first. 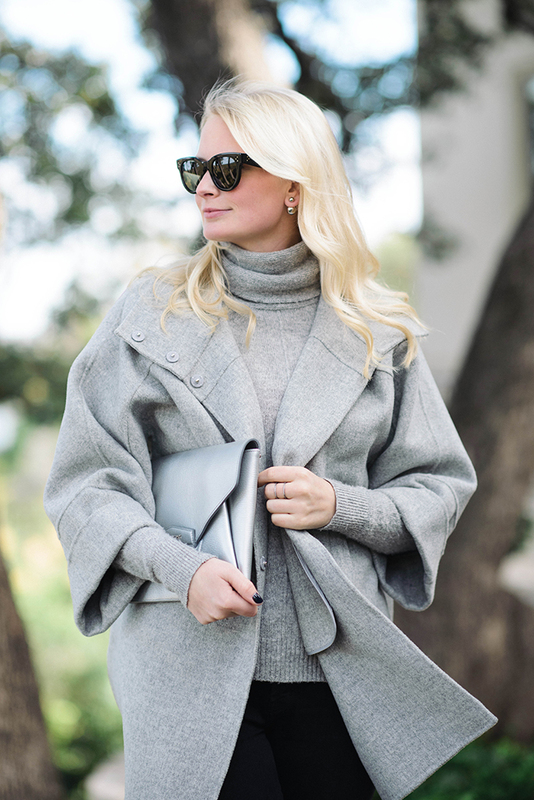 Love this oversized coat! You look amazing. Have a great weekend, Merritt!